Are We KPK, or is KPK Us? Yesterday, in “We Are…KPK!” I wrote about the current KPK crisis. Today, a reflection on why I translated KPK Adalah Kita as “KPK Is Us” rather than “We Are KPK,” as in the title of that post. The problem starts with the word adalah. It means “is/am/are,” in the context of (PRO)NOUN+TO BE+(PRO)NOUN, but as every beginning student of Indonesian will tell you, that’s not exactly right, because Indonesian does not have a verb “to be.” Yet this word adalah creeps into spoken and written Indonesian quite a bit. Compare Google hits for saya guru di [= I am a teacher in…] versus saya adalah guru di [= I am a teacher in…]. But I don’t think that emphasis is what’s going on here. Perhaps someone who speaks Indonesian better than I do will disagree with me, but KPK Kita and Kita KPK are both grammatically correct, yet neither sounds right. 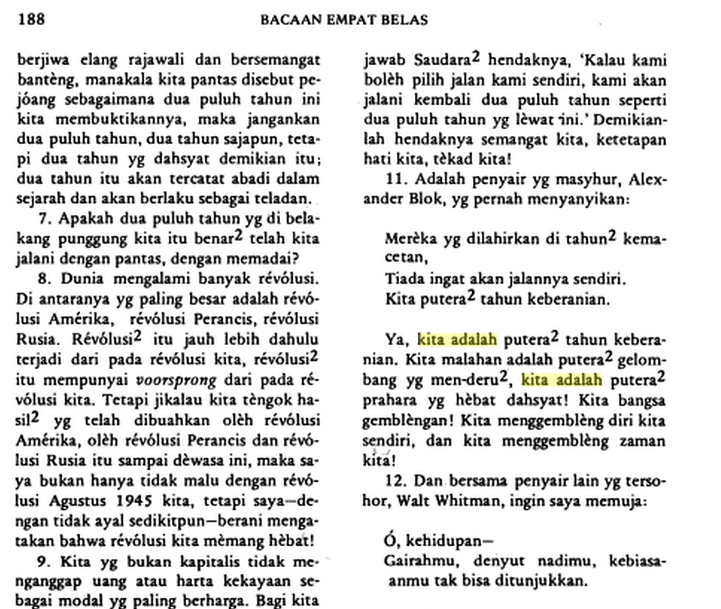 Is this an instance of language change in real time, the continuing evolution of Indonesian away from its origins as a simplified trade language? Now does this matter? I think it does, and I think that it’s the same difference between having written Je suis Charlie versus Charlie est moi. In the former, you are showing that you stand by Charlie Hebdo; in the latter, you claiming more directly that Charlie Hebdo could have been you. I don’t think it’s an accident that few people chose to say Charlie est moi. I think it is absolutely deliberate that in this latest KPK scandal, for the majority of Indonesians, KPK is us.